YOU ARE HERE:Home » Health Conditions » What’s the Best Way to Relieve Hot Flashes? My mother told me about these things. She suffered from them pretty regularly through her first several years of menopause. We tend to laugh at them. I’ll never forget Robin Williams in the cooking scene from Mrs. Doubtfire. Dressed as a woman, leaning over the hot cooking pots, he set his fake bosom on fire, and then tried to douse the flames with the pot lids. “My first day as a woman and I’m getting hot flashes!” he exclaimed. The real thing, though, is no laughing matter. Most of us would love to escape it, but studies show that up to 80 percent of women go through them. Is there anything we can do to make hot flashes easier to manage? It comes on suddenly, that flushed, warm feeling that rises over your chest, neck and face. Your skin turns red, and you may sweat a lot. The flash (or “flush” as it’s sometimes called) usually lasts somewhere around a few seconds to ten minutes, and can recur every hour, or as infrequently as once or twice a week. Women who experience frequent hot flashes, especially if they occur at night, can have other symptoms related to sleep disturbances, including mood swings, irritability, lack of concentration, and memory problems. Though we used to believe that hot flashes would last only a year—up to five years, at most—we now know that some women can go through them for even longer periods of time. 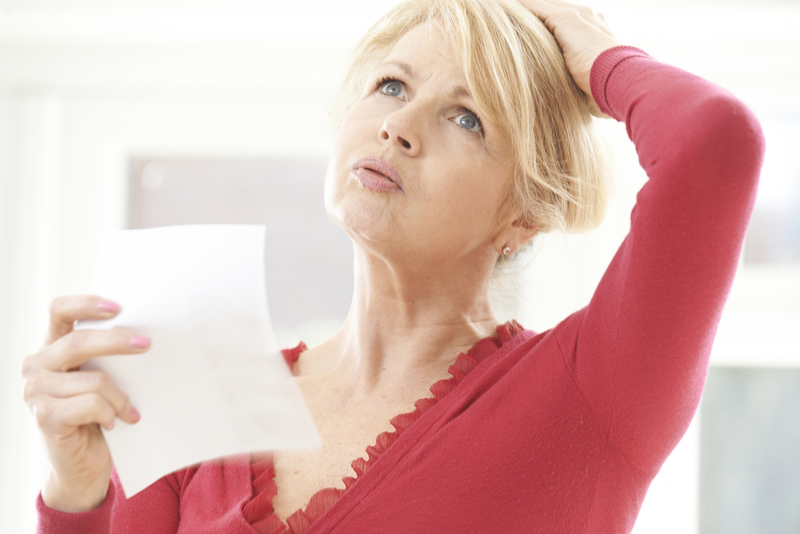 We don’t yet have all the answers as to why hot flashes occur in the first place. We do know the “warming” symptoms are caused by blood vessels in the head and neck opening more widely than usual. This allows blood to rush into these areas. Hot flashes are most common during the menopausal transition. They usually start in the first year after a woman’s last menstruation, or while her menstrual periods are tapering off. Hot flashes seem to be related to changes in hormonal levels that occur during pre-menopause and menopause. They may also occur after surgical removal of the ovaries, some treatments for endometriosis, or after certain cancer treatments. There seems to be a connection between the hormonal changes (as estrogen levels decline) and the neurotransmitters in the brain that affect the blood vessels. Some research suggests that the decreasing amounts of estrogen affect the hypothalamus in the brain, which controls body temperature, among other things. There is some research suggesting that hot flashes are connected to cardiovascular disease, but it’s too early to tell for sure. A recent 2015 study, for example, found that women who experienced more hot flashes, particularly at night, were more likely to have blood vessel issues in the brain that could lead to blood flow problems and stroke. Other studies have found that women experiencing hot flashes were more likely to have signs of artery narrowing and stiffness. On the whole, it seems that the hormonal changes that occur around menopause cause other reactions in the brain and body that bring on hot flashes. Women who smoke, who are obese, or who exercise infrequently also seem to have a higher risk of getting more hot flashes. Is There a Way to Stop Hot Flashes from Occurring? This remains the main method of treating hot flashes for one reason: it works. The medication restores declining levels of estrogen, helping balance things out and reducing symptoms. The concern is that the treatment may increase risk of heart disease, stroke, and breast cancer. The Women’s Health Initiative trial in 2003 found that estrogen therapy could increase risk of coronary heart disease during the first year of use. Women who took combination estrogen/progestin also had an increased risk in breast cancer. More recent studies, however, have shown that HRT may not be as risky as we thought. A recent Mayo Clinic review, for instance, showed that the treatment did not increase risk of mortality. Lead study author Khalid Benkhadra, M.D., stated the results should allay concerns for women suffering from serious menopausal symptoms who want to take hormones. Experts recommend women talk to their doctors about their symptoms, and evaluate the risks together. Antidepressants: At low doses, these may help some women to reduce the number of hot flashes they experience every day. They won’t work as well as hormone replacement therapy, but they may be an alternative for women who are concerned about taking hormones. Anti-seizure medications: Studies have shown that these drugs (particularly Neurontin, generically known as “gabapentin”) can decrease hot flashes up to 70 percent. Side effects may be significant, however, and may include dizziness, swelling in the hands and feet, and fatigue. Blood pressure medications: Some drugs used to lower blood pressure may also help to relieve hot flashes. One study, for instance, found that clonidine helped reduce hot flashes by about 15-20 percent. What if I Don’t Want to Take Drugs? If you’d rather not risk the side effects of medications, or if you’re concerned about the long-term risks of hormone therapy, you may be wondering if there are other alternatives. Scan the Internet and you’ll find hundreds of supposed “natural solutions” for hot flashes. The challenge is to separate the wheat from the chaff, so to speak. What really works, and what’s mostly hype? Soy supplements, for instance, were once all the rage for reducing hot flashes, but more recent studies came back with mixed results. There’s also some evidence that soy phytoestrogens may stimulate breast cancer in women who are at risk for the disease. Other herbal remedies—like black cohosh, for example—have been popular natural treatments, but so far, we lack any significant evidence of their effectiveness. A recent Cochrane review of 16 studies found no evidence to support the use of black cohosh against hot flashes. They did recommend further study, however, so you could choose to try the the supplement for a short period of time to see if it works for you. Scientists are also working to find new treatments. A study published in July 2015 reported that an experimental drug called “DHED” could treat hot flashes without the risks of hormone replacement therapy. The drug delivers estrogen only to the brain, so it does not affect the rest of the body, reducing any potential side effects. It will be a few years before we see new treatments like this on the market, though. Meanwhile, there’s the standard advice: eat right, get enough exercise, and try to avoid getting overheated. Wear layered clothing, and avoid spicy foods, caffeine, alcohol, or other “triggers” that may increase the frequency of your hot flashes. 1. Vitamin B (folic acid): You took it during your childbearing years to prevent birth defects. Now, you may want to take it again to reduce hot flashes. A 2013 study found that taking 1 mg folic acid a day helped reduce the severity, duration, and frequency of hot flashes. 2. Vitamin E: Try adding 400 IU daily. A 2007 study found that after four weeks of taking it, women experienced significant differences in severity and frequency of hot flashes. 3. Acupuncture: We’re not sure on this one yet, as we have only small studies, but it may help you. A 2012 study, for example, found that three treatments a week for 12 weeks reduced frequency and severity of hot flashes. 4. Sage tea: A small 2011 study found that a once-daily sage tablet containing fresh leaves helped decrease hot flashes by 64 percent within 8 weeks. Brew your own sage tea with one-tablespoon fresh sage leaves or 1 heaping teaspoon of dried sage per cup, or try using more sage in your cooking. Warning: Sage contains a substance that can cause neurological problems when taken in high doses. Check with your doctor and don’t consume large amounts. 5. Omega-3 supplements: You may already be taking a fish oil supplement for other health reasons, but if not, now may be the time to start. A 2009 study found that women who took an omega-3 fatty acid supplement reduced frequency of hot flashes within eight weeks. 6. Hypnosis: A recent 2014 study came back with positive news on hypnosis: it reduced frequency of hot flashes by as much as 74 percent. Hypnosis also improved sleep quality. Researcher Gary R. Elkins, Ph.D., noted that when compared with antidepressants and other non-hormonal therapies, hypnosis worked just as well. 7. Meditation: We have some early evidence that mindfulness-based meditation and stress reduction may help control hot flashes. In 2006, for example, researchers found that women who attended eight weekly classes (that included meditation and stretching) while practicing guided meditation at home six days a week decreased severity of hot flashes by 40 percent. They also decreased frequency by about the same amount, and increased quality of life by 28 percent. A later 2011 study found similar results, with women experiencing improvements in sleep quality, anxiety, and stress. Thurston RC, et al., “Menopausal hot flashes and white matter hyperintensities,” Menopause, June 8, 2015, DOI: 10.1097.GME.0000000000000481, http://www.ncbi.nlm.nih.gov/pubmed/26057822. Bechlioulis A, et al., “Increased vascular inflammation in early menopausal women is associated with hot flush severity,” J Clin Endocrinol Metab., May 2012; 97(5):E760-4, http://www.ncbi.nlm.nih.gov/pubmed/22399517. JoAnn E. Manson, et al., “Estrogen plus Progestin and the Risk of Coronary Heart Disease,” NEJM, August 7, 2003; 349: 523-534, http://www.nejm.org/doi/full/10.1056/NEJMoa030808. Prentice RL, Anderson GL, “The women’s health initiative: lessons learned,” Annu Rev Public Health, 2008; 29:131-50, http://www.ncbi.nlm.nih.gov/pubmed/18348708. “Menopausal Hormone Therapy Does Not Affect the Risk of Dying, Study Shows,” Endocrine Society, March 6, 2015, [Press Release], https://www.endocrine.org/news-room/current-press-releases/menopausal-hormone-therapy-does-not-affect-the-risk-of-dying-study-shows. Charles L. Loprinzi, et al., “Nonestrogenic Management of Hot Flashes,” JCO, October 10, 2011; 29(29):3842-3846, http://jco.ascopubs.org/content/29/29/3842.full. Nelson HD, et al., “Nonhormonal therapies for menopausal hot flashes: systematic review and meta-analysis,” JAMA, May 3, 2006; 295(17):2057-71, http://www.ncbi.nlm.nih.gov/pubmed/16670414. Soheila Bani, et al., “The Effect of Folic Acid on Menopausal Hot Flashes: A Randomized Clinical Trial,” J Carin Sci., June 2013; 2(2):131-140, http://www.ncbi.nlm.nih.gov/pmc/articles/PMC4161099/. Ziaei S., et al., “The effect of vitamin E on hot flashes in menopausal women,” Gynecol Obstet Invest., 2007; 64(4):204-7, http://www.ncbi.nlm.nih.gov/pubmed/17664882. Painovich JM, et al., “A pilot randomized, single-blind, placebo-controlled trial of traditional acupuncture for vasomotor symptoms and mechanistic pathways of menopause,” Menopause, January 2012; 19(1): 54-61, http://www.ncbi.nlm.nih.gov/pubmed/21968279. Bommer S., et al., “First time proof of sage’s tolerability and efficacy in menopausal women with hot flushes,” Adv Ther., June 2011; 28(6):490-500, http://www.ncbi.nlm.nih.gov/pubmed/21630133. Lucas M., et al., “Effects of ethyl-eicosapentaenoic acid omega-3 fatty acid supplementation on hot flashes and quality of life among middle-aged women: a double-blind, placebo-controlled, randomized clinical trial,” Menopause, Mar-Apr 2009; 16(2):357-66, http://www.ncbi.nlm.nih.gov/pubmed/19034052. Leach MJ, Moore V., “Black cohosh (Cimicifuga spp.) for menopausal symptoms,” Cochrane Database Syst Rev., September 2012; 9:CD007244, http://www.ncbi.nlm.nih.gov/pubmed/22972105?dopt=Abstract. Gary R. Elkins, et al., “Clinical Hypnosis in the Treatment of Post-Menopausal Hot Flashes: A Randomized Controlled Trial,” Menopause, March 2013; 20(3):10.1097/GME.0b013e31826ce3ed, http://www.ncbi.nlm.nih.gov/pmc/articles/PMC3556367/. Carmody J., et al., “A pilot study of mindfulness-based stress reduction for hot flashes,” Menopause, Sep-Oct 2006; 13(5):760-9, http://www.ncbi.nlm.nih.gov/pubmed/16932242. Carmody JF, et al., “Mindfulness training for coping with hot flashes: results of a randomized trial,” Menopause, June 20111; 18(6):611-20, http://www.ncbi.nlm.nih.gov/pubmed/21372745. Laszlo Prokai, et al., “The prodrug DHED selectively delivers 17B-estradiol to the brain for treating estrogen-responsive disorders,” Science Translational Medicine, July 22, 2015; 7(297):297ra113, http://stm.sciencemag.org/content/7/297/297ra113.